The music played during your evening reception and indeed the rest of your day, is the most important thing I do….and it’s vital that I get it right to ensure the success of the your wedding! It’s also the most complicated part of my job! I’m often asked by prospective brides for a copy of my set-list. Whilst there ARE DJs who will expect to turn up and play a predetermined set of tried and trusted tracks, it’s rarely successful. It works in nightclubs, but not at weddings. Weddings are a real juggling act in relation to the music to ensure that you and your guests are happy and are able to enjoy the evening. My music collection is sorted into various different “go-to” lists (i.e. by genre, year and favourites), I never pre-compile a playlist for the entire evening because I really can’t tell before I turn the music on just how your guests are going to react. I also cater for many different music styles and policies. For instance, some brides prefer the “party classics” whilst others don’t want to hear them. Some brides have a specific type of music theme in mind (for instance UK Garage, Classic Rock, or the ’80s as examples), whilst some prefer a mix of everything to please all of their guests. That choice is entirely up to you! You’re also more than welcome to provide a playlist for the evening, from just a few personal favourites or music requested by your guests, to the entire evening’s entertainment. However, please be warned that I won’t play music in a particular order (because it really doesn’t work), and if you’re providing the entire evening’s playlist, I can’t guarantee that guests will dance….the musical tastes of your guests might not be the same as yours! 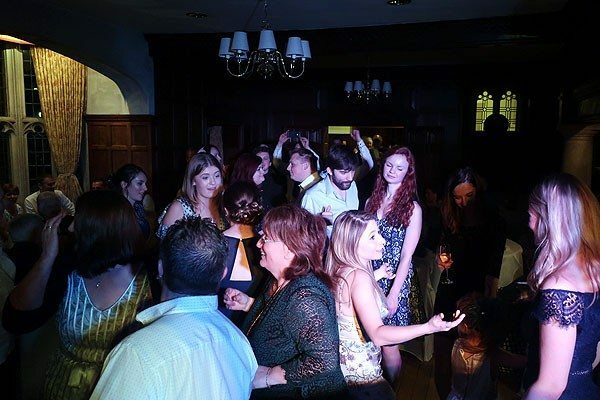 As a general rule (and unless you’ve told me to do otherwise), I will play music to suit the guests that are at your wedding reception (after all, if they don’t hear music they want to dance to….they won’t dance!). I prefer NOT to cater for weddings which have a strict playlist containing modern R&B, Rap/HipHop or Drum & Bass – they’re not my specialist area and I really wouldn’t want to let you down on your big day! Want to see some recent playlists? Not a problem at all. The software I use to play the music logs everything I play during the evening. The tabs below will show you the music that’s been played at some recent wedding receptions. Please note though….each and every wedding reception is unique and much of the music played has been requested by the bride and groom, or by their guests on the evening! Your wedding playlist will be completely different based on YOUR personal preferences! Kimberley and Jason’s wedding reception was an informal and relaxed evening where the music choices were left entirely to the guests, plus a few of my own selections (this is usually the most successful type of reception). The age ranges of guests varied from the very young to the very old….it was a reception with a wide variety of different music tastes and genres. Usher ft Ludacris and Lil Jon – Yeah! Sophie and Tom’s wedding reception was a small and informal evening in a local hotel with just 42 guests. Despite being a small reception, the dance floor was full for the duration! There was no music policy in place for the evening and the songs played below were a mix of my own choices and guest requests on the night. Jade and Tom did things a little differently for their wedding reception. The evening started with their first dance (Praise You by Fat Boy Slim), and then went into an hour’s worth of Ceilidh dancing before creating a relaxed party atmosphere to end the evening. Jade and Tom provided the entire playlist for the evening based on their favourite dance tracks, and no guest requests were allowed on the night. Whilst this normally makes me very nervous, this one worked an absolute treat – I really couldn’t have picked better myself if I’d tried!